Exercise having numerous health benefits. The regular exercise helps to control weight, improve mood, promote better sleep and many other health benefits. Our body releases endorphins during exercise which made you happy and helps to fight with daily stress. Today many people are working out heavy exercise without taking care of diet. This is usually the normal reason for hair loss. Too much of anything can create a problem as this implies in our body also. 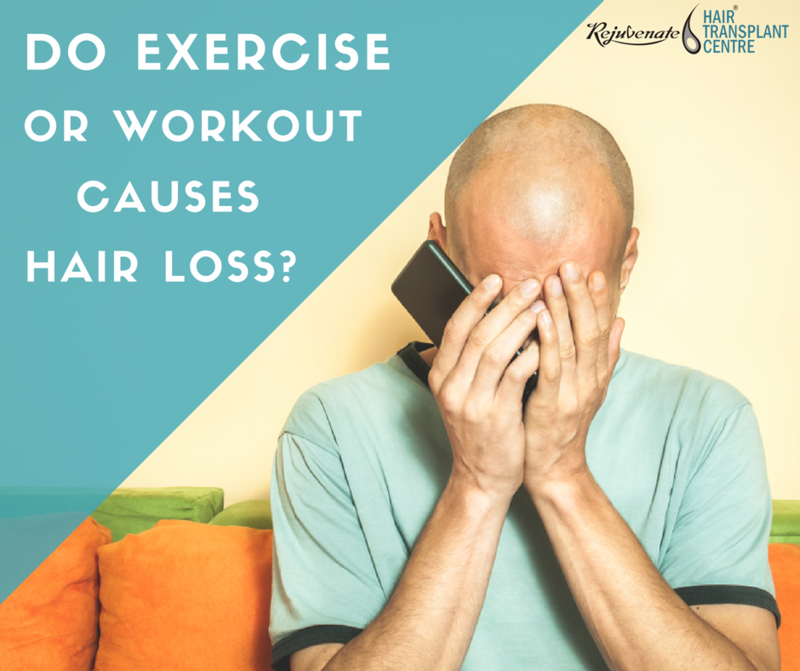 Many experts believe that excessive exercise also causes a state of chronic stress in the body which also lead to hair fall. Regular exercise does prevent some forms of hair loss because it boosts general health as well as circulation. But exercising heavily without taking a good amount of diet lead to the problems of hair loss. According to the American Hair Loss Association, 25 percent of men suffer from hair loss at the early age of 21. And they found that chronic stress leads to telogen effluvium. Extreme bodybuilding and other extreme exercise activities produce more dihydrotestosterone (DHT), which causes baldness in men. Conversely, mild exercise, like regular jogging or cardio, can help to reduce DHT. Healthy exercise, proper sleep and rest to the body, consumption of proper nutritional food, water helps in reducing the stress in our lives and promote healthy hair. Fitness freaks push their body and also take steroids; these steroids are similar to testosterone, the main contributor to hair loss. In some extremely rare cases, excessive exercise without steroids can raise testosterone levels and lead to hair loss. Excessive Workout Can Cause Hair Loss: Excessive workout for over a prolonged duration leads to chronic stress on the body. This, in turn, causes Telogen effluvium (TE) a condition in which hair follicles go into an early resting (telogen) phase and leads to hair loss. Intake of Powdered protein Shakes with hormones and growth factors Lead to Hair Loss: A number of men who work out to maintain their bodies, also take special diet such as a Protein shake. These shakes contain growth factors and hormones. It increases the hormone testosterone levels which in turn increases dihydrotestosterone (DHT) levels and causes hair loss. This occurs mainly in men who are predisposed to baldness due to heredity. Thus it is necessary to restrict the intake of protein shakes highly. Intake of Steroids While Working Out Causing Hair Loss: Athletes and others use anabolic steroids to increase the effectiveness of workouts. Since steroids are like testosterone, in long-term it leads to hair loss. Type of Workouts That Can Lead to Hair Loss: Hair loss is prominently seen in case of the heavyweight lifters. Other workouts that can contribute to hair loss include swimming. The water in swimming pools contains a high amount of chlorine and other chemicals which cause harm to the hair. They make the hair dry and follicles brittle thus leading to hair loss. Improper Diet Post Workout Can Cause Hair Loss: Diet which is not rich in proteins leads to protein malnutrition. Improper or insufficient diet post workout can cause serious hair loss problems. It affects all the body’s protein makeup along with the hair making proteins. This affects hair formation and growth. Lack of Proper Hair Care Post Workout Causing Hair Loss: Work out and exercises lead to a lot of sweat. This, in turn, leads to accumulation of dirt in the hair. A dirty scalp affects the hair follicles and in turn, leads to loss of hair. – Hair is made of protein. Hair growth requires Vitamins A, B, iron, zinc and omega-3 fatty acids and protein. Thus, consuming a good nutrient rich diet full of proteins, vitamins and minerals are essential to prevent loss of hair due to workout. – Taking good care of your hair is important to avoid sweat and dirt getting accumulated on the scalp. After working out, one should wash hair regularly with mild shampoo and gentle scrubbing to ensure that the scalp is kept clean. In addition, tight hairstyles such as a ponytail or plait should be avoided and looser hairstyles should opt. It is necessary that one is gentle while brushing and styling the hair. – To avoid physical stress, one should not overwork in the gymnasiums or perform excesses of exercises. It is recommended that the weightlifters should also perform aerobic exercises and should perform weightlifting in moderation. Further, it is advised that one should have a fixed schedule of exercising for five days a week for one hour per session. Performing mild exercises like jogging or aerobics can help to reduce DHT levels and prevent hair loss. – You can consume good quality whey protein shakes, also people who work out should eat natural protein containing food such as milk, eggs, fish, and chicken. This diet is healthy and will not have deleterious effects such as the hair loss. – To prevent hair loss due to swimming, one can avoid it by wearing a swim cap. After getting out of the pool, one should take a head bath.